My friends!! Well let's start this fine Monday morning with an apology. The photos today are kinda not my greatest effort. I have two little point and shoot cameras that I use for blog work, and one does much better macro, which is why I love it for book posts, but the other has better color tones, and well, I used the one I like for the color tones, and GOOD GRAVY, but these pix are not the crispest. OH WELL. 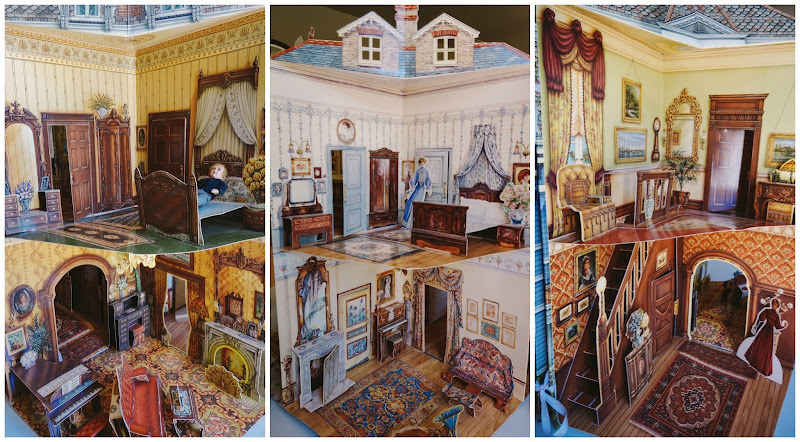 Let's look at that Victorian paper dollhouse I gave you all a little preview of on Facebook and Instagram! So, a couple of years ago, a great pal gave me not one, but two! 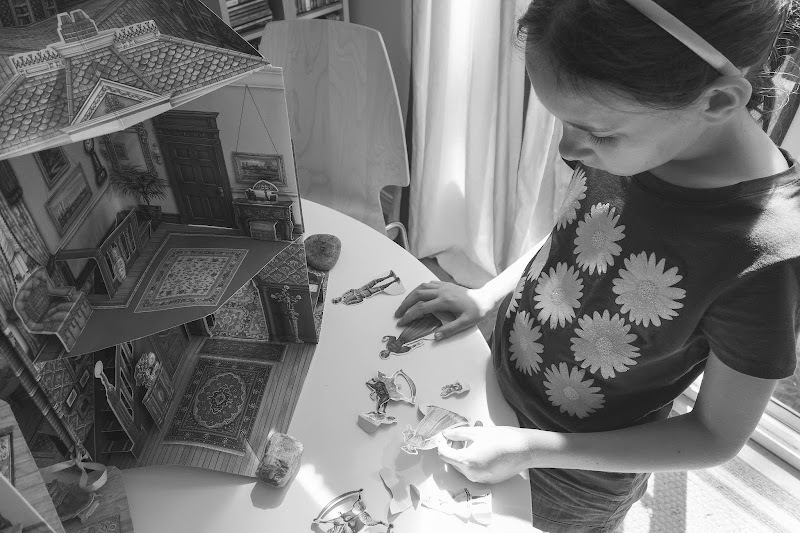 paper dollhouses. 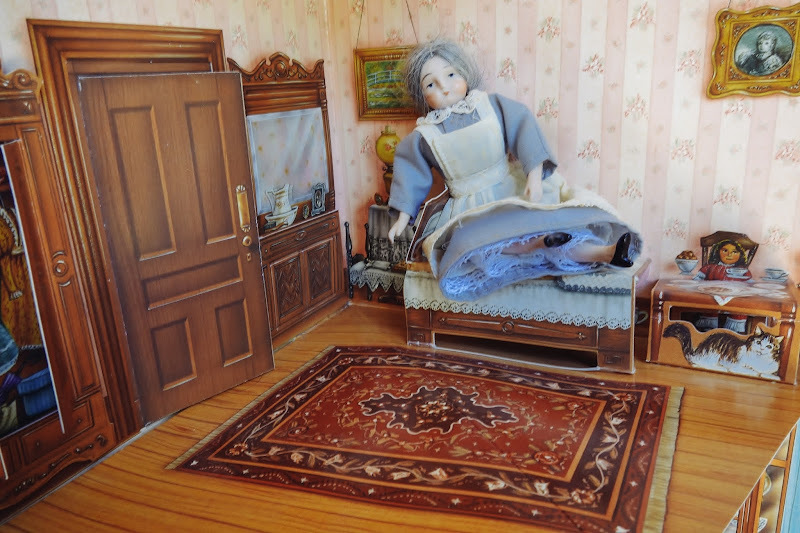 Specifically, she have us a Victorian three dimensional paper dollhouse, and an Edwardian paper dollhouse. 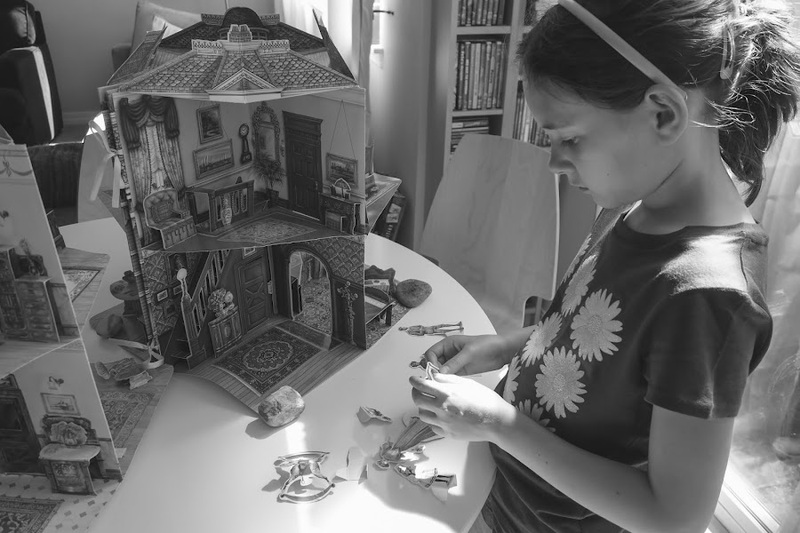 My friend had a baby and a toddler at the time, along with her other young daughter, and she just thought that her kids would rip the dollhouses to shreds, and she knew I was into this sort of thing. YES. That would be an understatement. I put them into a bookcase in our spare room, and then GASP - I forgot about them for a while! I think I was waiting for Julia to get to an age where she might appreciate them a little bit. I came to my senses last week and brought them out, set them up and gleefully watched as my daughter and her buddy's jaws dropped on the floor. 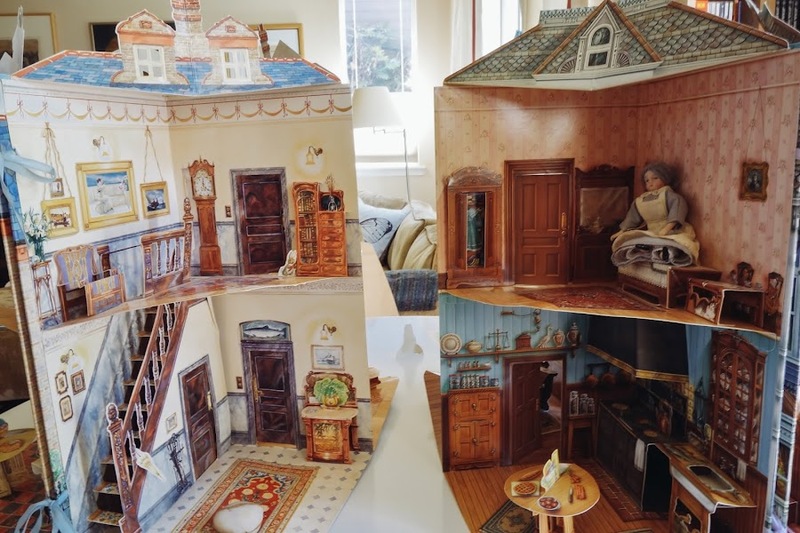 They LOVED these dollhouses! Oh if you see some rocks in the pictures, it's because the floors, particularly in the Victorian house, do not want to lay exactly flat. But that's no nevermind biggie to us! So let's chat about the two styles - I love the colors and light and airy feel to the Edwardian house - it's more pastel in color and it's prettier, in my opinion. But the Victorian one is amazing in a different way, more ornate, more richly toned in color and has gorgeous and intricate detailing. Check out the music room down below right here. This is my favorite room! Look at the dining room! I think this one is in the Edwardian. Oh and let me also throw in that the houses come with sets of mini-sized paper dolls, but many of those had been lost. So I hauled out my old old old dollhouse dolls, which OH MY GOSH YOU GUYS - I wish you could have seen them when they were new. My dolls came from London, and they had the most beautiful clothes and hand painted faces and and and - they just did not survive storage in a Hawaiian climate very well when I went away to college. Chipped faces, slightly moldy clothes and broken body parts. Julia thought it was hilarious that we were like, oh well, this boy has no leg, and this Mama has no hand, and the Father has no arm. Only the little girl has all her arms and legs. And the Grandma/Nanny/Housekeeper is the only one in decent condition, she has a china face and limbs that have held up well. She's our favorite dolly to play with! Isn't she darling?? We love her! You can see the Daddy and the little girl dolly in this picture below. She used to be my FAVORITE, when I was young. And there you have it! True confession time - Julia and her friend played with it all one afternoon and haven't really looked much at it since - I'm hoping she'll play with me more with it this summer. 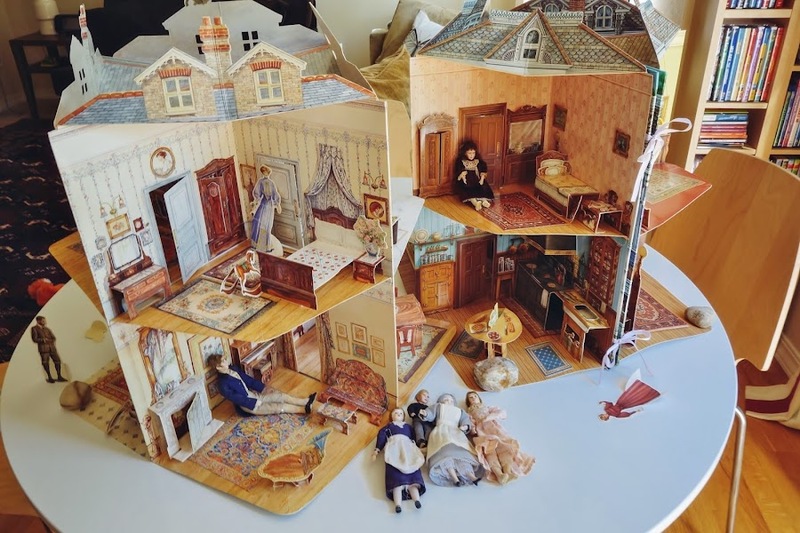 Actually these paper dollhouses are giving me great inspiration for how I'd like to re-do my own real wood Victorian style dollhouse, which is in need of a facelift and new furniture that still looks old-fashioned. I had put toddler friendly dollhouse furniture in mine when Julia was young, because most of my old stuff had become really moldy in storage. 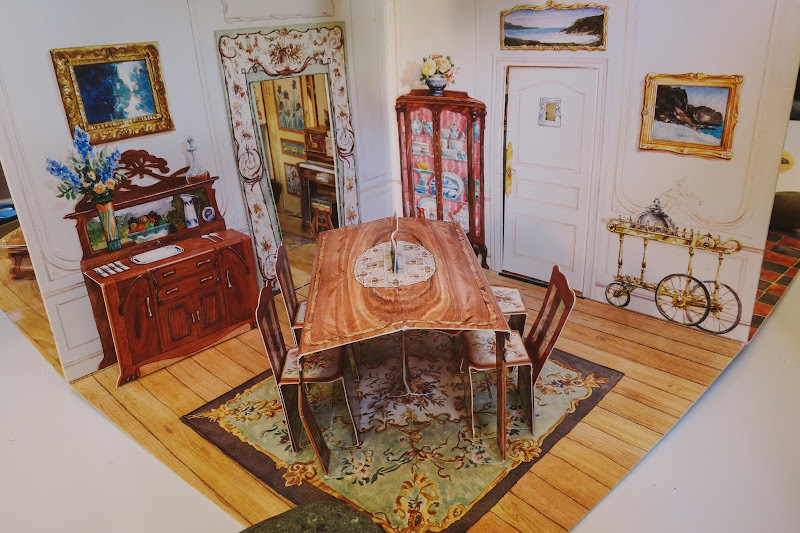 It's been on my To-Do List for about a year now to scour Ebay and online dollhouse sites to try and find pieces to bring it back to its vintage glory. 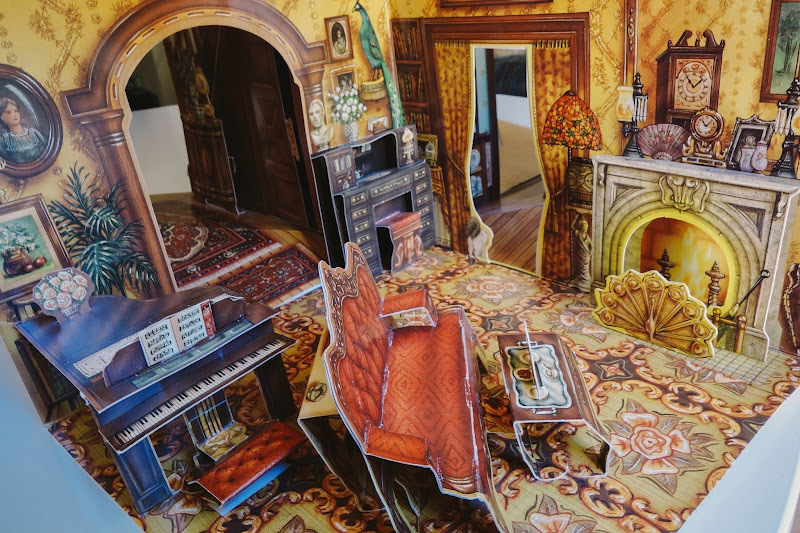 My dollhouse is wallpapered and a lot of it is now torn. I'd also LOVE to have it electrified, since we live in gloomy Seattle and I don't have it in a well lit location because it's so darn big. If you want to see some really terrible pictures of it back in my early blogging days, see here. 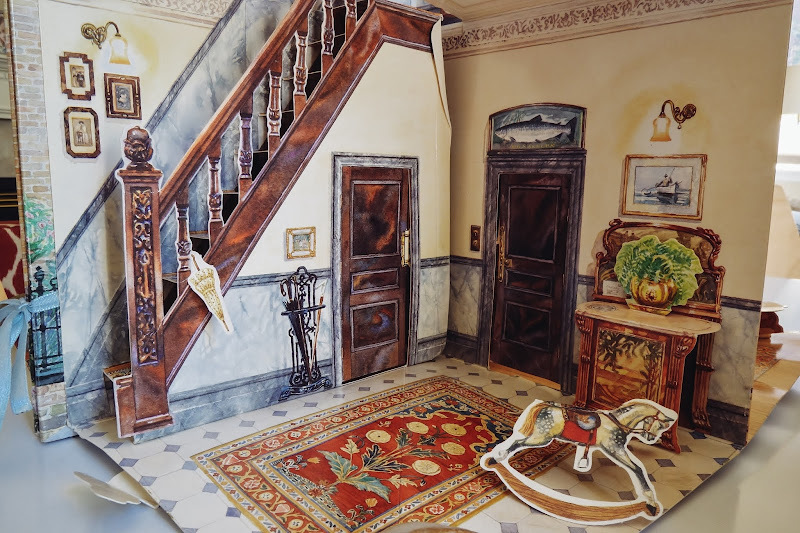 And if you want MORE dollhouse stuff to look at (and WHO DOESN'T????) 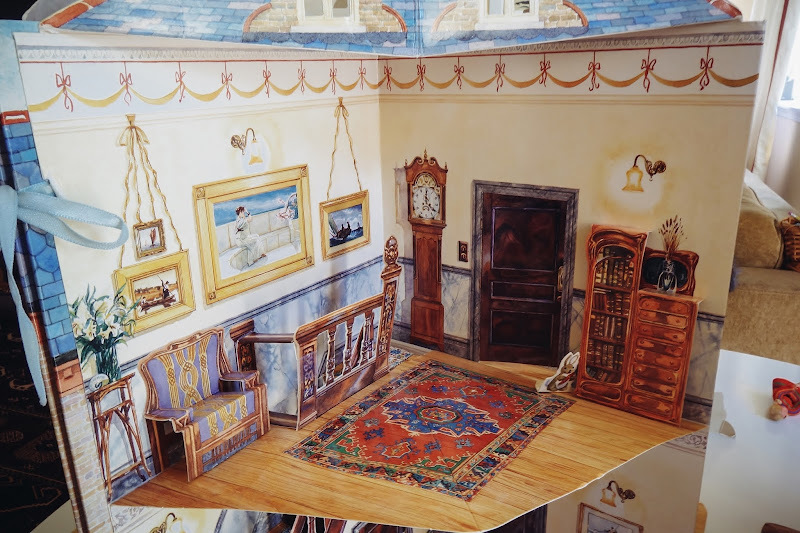 you can see this post and this one - they feature two of the best books about dollhouses you will ever ever read. 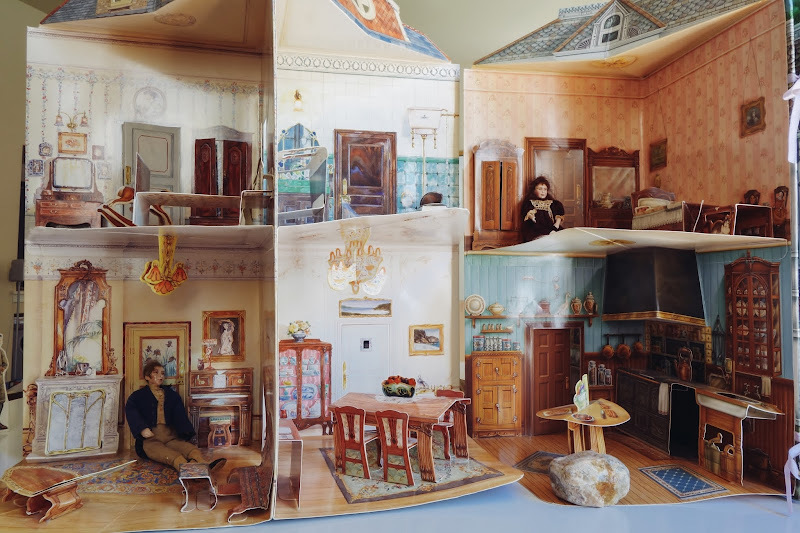 Those dollhouses are really neat! 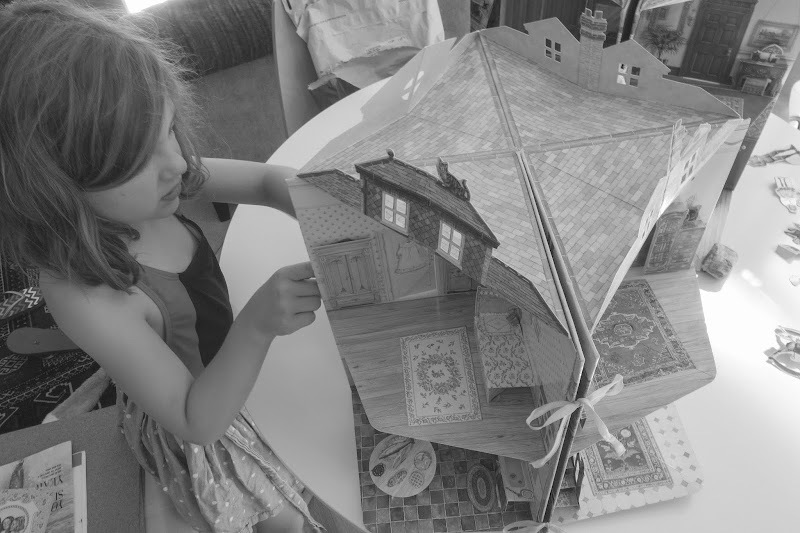 My girl has a fairy tree house paper "doll house" - it is such fun to look at it and find all the little hidden features. The people who figure out how to make these things are geniuses! I really need to get moving on that project. My dollhouse was redone for me when I was 11 and I played with it every day between 11 and 14. I had originally received it when I was 7, and hadn't played with it much. I need to do what I want to do with it before Julia gets too old for it!! These are awesome! My youngest would have a blast. 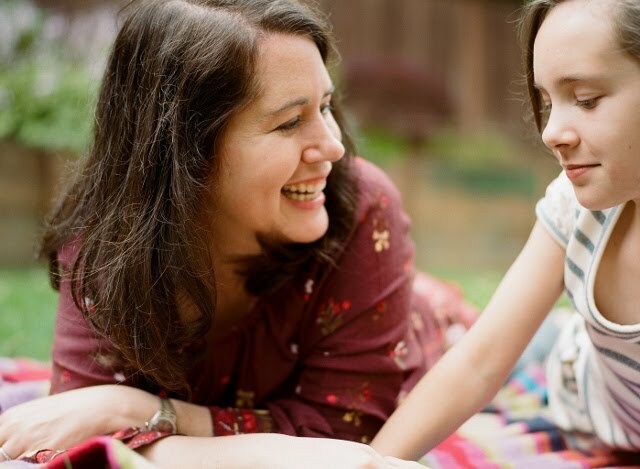 (My oldest would play with her for a while, then be done.) I still want to make a good-sized solid dollhouse someday, although storage would be an issue. Paper is rather genius. My brother and sister-in-law recently got back from a trip to England and they got to go to Windsor castle...and saw THE royal dollhouse. They said it was AMAZING!!! Michelle!!!!!!!!!!!! Miss you, darling girl!!!! Oh I'm pea green with envy! That's my DREAM. I've been to England a few times, and never seen it!!! !